Derrick Rose said Thursday he’s close to playing but not quite there yet. Is that what they call deja vu all over again? Hey, didn’t Rose say that in Los Angeles a few weeks back, and in Boston maybe a few weeks before that? And so goes the latest installment of the ongoing Return of Rose saga that has pretty much been playing out in Chicago the last two months. That’s right. Two months, and pretty much the same answer Bulls coach Tom Thibodeau gave in January and before Thursday’s game against the Portland Trail Blazers. Thibodeau said Taj Gibson and Kirk Hinrich would return and Hinrich was listed as a starter. Thibodeau was once again as he is several times a day asked about Rose and said as he always does that “nothing has changed” and that Rose remains on course. No one but Rose knows if and Rose is going to play this season. Though Rose did add some omnipotent voice to that. Though Rose said Thursday he doesn’t pay much attention to the progress of Ricky Rubio and Iman Shumpert, both of whom had ACL surgery last year around the same time, Shumpert got a huge scare Wednesday night in the game against Orlando that could give Rose pause. Shumpert said he heard a pop in his knee, though initial reports are it isn’t serious. Still, that issue remains. Rose isn’t going to be fully healthy if he returns this season and will be playing limited minutes as a result. There’s a variety of opinions on this from that he needs to play to cross the mental hurdles, which is in effect part of his rehabilitation to what’s the hurry and that he should return next season when he can play without any restrictions. “I’m still taking my time, still trying to be patient and listen to my body,” Rose said after a workout with the team and then his usual hard pregame shooting workout before the game with Portland. “I feel when I’m ready to come back I’ll be ready no matter when it is,” Rose said when asked if there was a date after which he couldn’t or wouldn’t return. “Whenever I’m ready I’m going to be out there. It’s (explosion) coming. I’m not panicking or anything. If anything, I think I’m going to be a better player. I’m just taking my time, being patient, doing all the right things and really eating right and getting rest. I’m way stronger. Just seeing how I’m going to put that in my game, I don’t know yet. When we’re playing five on five, I’m trying to pick the right spots and really find out how strong I am. There, of course, were rumors about a return in late February, which faded some. They have heated up again with almost daily speculation and reports, like when Comcast moved up the schedule to televise the Bulls/Denver game Monday. That was viewed as a signal. 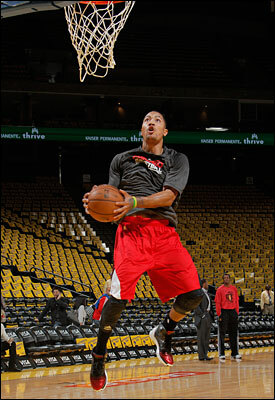 Then there was Rose warming up with green sneakers for the St. Patrick’s game. That certainly meant he’s playing. Now, it’s that his workouts with the team have accelerated, so there was talk he’d play Thursday. Thibodeau denied that before the game. Then someone said it probably will be Saturday against Indiana so he’s ready to face Miami Wednesday. Good thing the Bulls don’t play on April Fool’s Day. “Just getting used to my activity picked up a little bit,” Rose said. “Just getting used to running, playing five-on-five, doing everything I used to do. During five-on-five (scrimmages), I’m very comfortable when I’m out there playing. If anything, it’s much easier because I can shoot the ball much better. Sometimes, you kind of think a little bit when I’m out there. That’s when I know I’ll be ready to play, when I’m out there not thinking but reacting. “I got my teammates behind me and they see how hard I’m pushing in practice and I’m seeing how hard they’re fighting for me on the court, it makes me want to go harder,” said Rose. “It makes me want to be out there more, too. But you have to look at the big picture. Everybody is different. I watch them play here and there (Rubio and Shumpert). They’re playing good basketball. It just gives me a lot of confidence so that when I come back I know I should be all right I really don’t know (percentage of how he is) right now. I don’t want to put place a percentage on it. I just know I’m close and I’m taking every day serious.